Changing Your Career: What Kind of Mouse Are You? 20 years. Over 28,000,000 copies in print. #1 international bestseller. 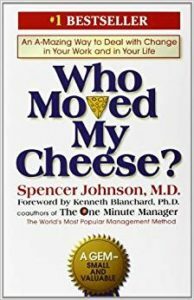 There is a reason Who Moved My Cheese? continues to resonate. Its message is simple yet powerful: change will rock us, but we hold the power through our response. Just like the allegorical mice, we can surrender hopelessly or search for more promising alternatives when our workplace satisfaction level is disrupted. We have the power to improve the outlook by choosing to respond by leaving or staying put (with a goal to stay and thrive rather than stay and survive!). Overall, on a scale of one to ten, how satisfied (one being most satisfied), are you in your career overall (career, not job or work)? If you feel like you just have a job instead of a career, does this matter to you? If you answered five or higher to question 1, specifically what is it about your career that is not satisfying you? Is it your position, title or status? Is it the kind of projects or tasks you’ve been involved with? What about the kind of people (your boss, colleagues, clients, vendors) you’ve been working with? Are you bored? Are you compensated fairly? Do you have the benefits (flexibility, time off, insurance, 401k, etc.) that you’d like? Are you learning? Are you challenged? Have you been doing the same kind of work for more than two years? If so, it may be time to find a new project or shift your work slightly. Does your work have meaning for you? Do you feel as if you are making a difference in the world, or simply earning a paycheck? Do you have a dream or fantasy about doing another kind of work, or shifting the way you work (fewer hours, telecommuting, etc.)? Even if you are satisfied with your career, what is the one thing you would change about it? It is natural for employees to doubt the health of their careers and reflect on these very questions; in fact, Jansen encourages us to do so at least annually. For over a decade, I’ve asked myself some of these very questions about my current work environment. Ultimately, I’ve chosen to stay and thrive rather than leave, making slight adjustments along the way to when I work, where I work, with whom I work, how I work, and what my work entails. It is worth noting this is not always possible. Sometimes we have to leave to find somewhere we can stay. I worked at (and left) 4 other organizations before finding this place where I now choose to remain and evolve. Through these experiences, I’ve found that small, internal changes can be less stressful and just as fulfilling as big career moves; still, choosing to stay put demands constant awareness and motivation to avoid stagnation and frustration. Identify all benefits, and benefit from them. Maybe your employer won’t grant you perks like “Panda Fridays” off or $4,000 in “Baby Cash”, but maybe they will help fund your past or future education goals. Maybe they also will let you volunteer during a portion of your work hours. Perhaps they will provide or offset gym membership. Even the common benefit of vacation time can help our ability to regain contentment and revitalization (if we’ll actually let ourselves venture out and unwind!). In fact, each year, The Charlotte Observer and Charlotte Business Journal reveal the top places to work–likely because they do offer these perks and more! Ask for a lifestyle raise. Sometimes flexibility buys us more happiness than a slight bump in our paychecks. It’s difficult to put a price on the ability to leave work early and beat traffic jams or on the option to work remotely one day a week so we can get to yoga and eat lunch with our child at school (or just work in our PJs all day). Promote yourself. Every workplace has challenges and needs not being addressed. Can you be the one to do something? Do your homework, and pitch your ability to step up as a leader. The opportunity can revolutionize your experience at the organization (and rev up your rep). Shock: “What will you do when you get bored?” the interview committee asked. I was dumbfounded and struggled to spit out a clever response that would help portray my weaknesses as strengths. In the end, I naively explained that I’d adjust lessons and assignments to remain engaged. They hired me for the full-time faculty position despite myself, and for that, I am grateful. Twelve years later, I now know what they likely knew then: Sometimes that’s not enough. Shift: Everything was going fine teaching writing and research until about year 7 when the itch would not be soothed. I had been scratching in many ways that worked from chairing decision-making committees to trying out those new ideas in the classroom (both on-campus and online). It wasn’t enough though. That is when I dug in and did some research about existing options for a challenge after an “exemplary” performance left me feeling less than an example employee. Shift: All good things must end though. When my College Fellows project wrapped, I felt lost again. The discontent crept in, but I would not give up that easily. I now knew I had options to keep my work exciting. Satisfaction: The next steps I took allowed me to feel part of something bigger than myself. I continued my former duties but joined a committee tackling online education issues that mattered to me. It was motivating to help make changes where I worked but as part of a team. Shift: As happens, the innovative work we were doing had to take a back seat to other organizational priorities screaming for attention. I once again felt lost… until my department had a problem that needed solving. 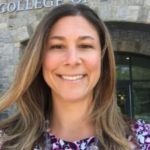 My supervisor welcomed ideas to create community and improve communication for our part-time faculty members who often teach at multiple colleges and hold careers in other industries. Satisfaction: I did a little research and figured out that I could do the work needed to be part of a solution. The job of a “Part-Time Faculty Coordinator” didn’t even exist, but I knew one could. Feeling a little hopeful and a lot unsure of what my manager would say, I put myself out there with a job description that would target the problem. My proposal went through the chain-of-command and was accepted. This led me into a new position where I still get to perform a portion of my teaching duties but also get to serve fellow faculty. The impact has been so promising that two other departments have implemented similar roles for their areas. This summer, I’ll be presenting on the pilot project at the Symposium for Part-Time, Adjunct and Contingent Educators. There, I will contribute best practices and take home new strategies. I’m in a good place right now. The work I do is challenging yet rewarding. I get to be creative and help others in familiar and new ways. I have expanded my internal network and deepened existing relationships. I am honing everyday skills and learning new ones. I see my work and personal lives behaving more harmoniously. I feel fulfilled 4-ish out of 5 days. None of these character-sharpening experiences would have occurred had I surrendered by jumping ship or becoming complacent. Looking ahead, I do not know when or where the cheese will move next. I just know that it will–and that when it does, I’ll be ready to hunt it down. 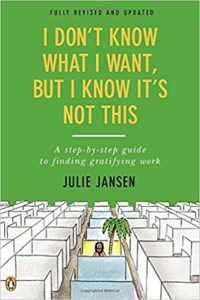 Get in gear to revamp your own career–whether you leave or stay and thrive–by checking out a copy of the classic Who Moved My Cheese?, or Julie Jansen’s I DON’T KNOW WHAT I WANT, BUT I KNOW IT’S NOT THIS, from your nearest Charlotte Mecklenburg Library branch (including the digital one). Stay tuned for my next post where I’ll discuss options for when you can’t stay put and stay happy! Shannon Blair is a writer, writing instructor, College Fellow, part-time faculty coordinator, and continuous self-reinventer at Central Piedmont Community College. She enjoys exploring all that Charlotte has to offer with her family and loves the library!